The input data set TEST is created from simulated data. A partial listing of the data set TEST produced by PROC PRINT is shown in Output 25.2.1. The REG procedure processes the input data and writes the parameter estimates to the OUTEST= data set A. Output 25.2.2 shows the printed output produced by the REG procedure, and Output 25.2.3 displays the OUTEST= data set A produced. The SIMLIN procedure processes the TEST data set using the estimates from PROC REG. 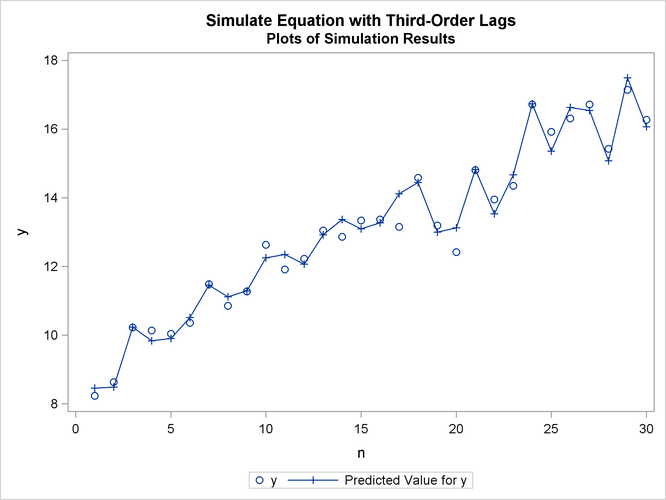 The following statements perform the simulation and write the results to the OUT= data set OUT2. The printed output from the SIMLIN procedure is shown in Output 25.2.4. The following statements plot the actual and predicted values, as shown in Output 25.2.5. Next, the input data set TEST is modified by creating two new variables, YLAG1X and YLAG2X, that are equal to YLAG1 and YLAG2. These variables are used in the SYSLIN procedure. (The estimates produced by PROC SYSLIN are the same as before and are not shown.) A listing of the OUTEST= data set B created by PROC SYSLIN is shown in Output 25.2.6. OLS 0 Converged y y 0.22675 0.14239 0.77121 -1.77668 . . -1 . . IDENTITY 0 Converged ylag1x . 0.00000 . . 1 . . -1 . The SIMLIN procedure is used to compute the reduced form and multipliers. The OUTEST= data set B from PROC SYSLIN is used as the EST= data set for the SIMLIN procedure. The following statements perform the multiplier analysis. Output 25.2.7 shows the interim 2 and total multipliers printed by the SIMLIN procedure.